The highly automated treatment facility, serving a population of 90,000, was recently inaugurated by the President of Portugal, Marcelo Rebelo de Sousa, and is named as a national environmental benchmark for future developments. MBR treatment plants work without the addition of chemicals and with relatively low energy consumption, combining secondary and tertiary treatment and eliminating traditional sand and carbon filtration. 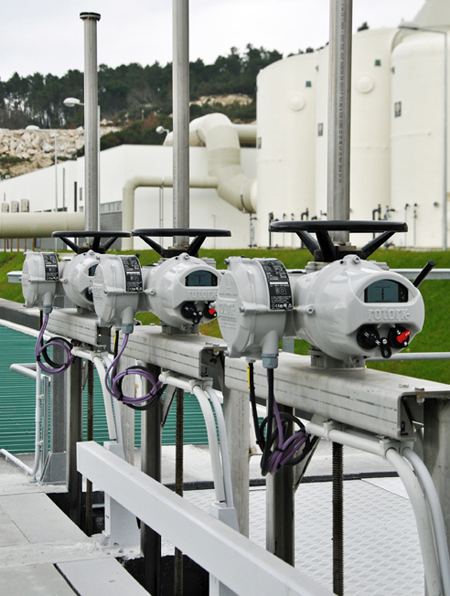 Centralised process control and automation at Viseu Sul is facilitated using Profibus DP network technology, utilising Rotork’s latest multi-turn and part-turn intelligent non-intrusive electric actuators (IQ and IQT respectively) to operate penstocks and butterfly valves for flow control throughout the wastewater treatment process.